Elevate Software is a small software company located in North Tonawanda, New York. North Tonawanda is just south of Niagara Falls and just north of Buffalo in the western end of the state of New York. We specialize in selling royalty-free database engine products (DBISAM and ElevateDB) directly to database application developers, especially those with very high distribution requirements like those that sell packaged software solutions. However, we have recently begun to expand into the web development market with the introduction of our Elevate Web Builder product. Elevate Web Builder is an integerated development environment that allows for rapid development of web applications. The company was started in 1998 with the introduction of the DBISAM embedded database engine product for Borland Delphi 1/2 as a BDE (Borland Database Engine) replacement for desktop databases. DBISAM's initial feature set has since been dramatically expanded, and now includes a DBISAM Database Server and cross-platform usage under both Windows and Linux. 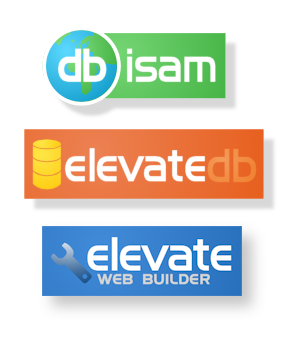 In 2007, Elevate Software introduced a brand new database engine product called ElevateDB that was intended to take over where DBISAM had left off. ElevateDB is a complete SQL 2003-compliant relational database engine with Unicode support, views, triggers, stored procedures and functions, constraints, and replication. ElevateDB supports most development environments available today.